Independent Kaszazz Consultant #108320 - specialising in card making, scrap-booking, paper-craft workshops and free demonstrations. Based in Adelaide but will assist you where ever you live! - then after you've found that book you've always wanted at Ascot Park, head over to Westbourne Park Uniting church who are hosting a "more than a car boot sale", at 27 Sussex Tce, Westbourne Park, including live music by Sevenfold​ and a sausage sizzle - yum! - after you've enjoyed all that, find a shady tree and relax while reading the information about joining Kaszazz​ as a consultant as the current months' amazing special offer ends on Tuesday, or check the workshop programs above and then book your spot ASAP! Special offer - value packs! The special offers are coming thick and fast! In addition to the fantastic New Consultant offer available during March, there is a special set of stamps only available for this month, plus a new offer of a $100 value pack for just $50. And there are 4 different packs to choose from - buy one or buy them all! Woo hoo!!! Contact me to place your order ASAP. 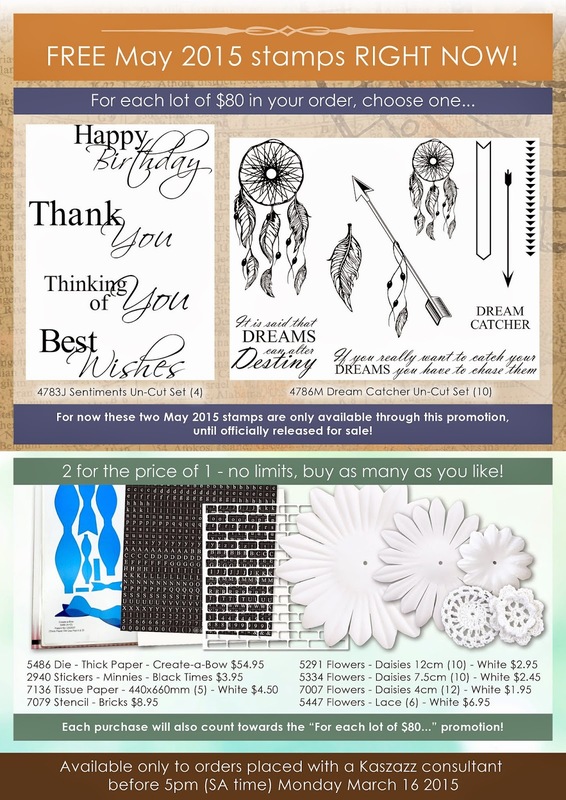 Due to popular request, I have amended the Blackwood workshop program and included an additional session of the "Springtime Dream Tags & Cards" by Jasmine Eccles. Be sure to pay your deposit and book your seat as soon as possible! Don't delay - offer expires 5pm Monday 16 March! Grief is a funny thing - some days you can do all the usual normal things with the usual amount of energy and enthusiasm, and other days you can't. Well, this has been my experience for the past few weeks. I will dearly miss my friend Karen, but I know she would want me to get back into crafting, so here I am back again! Kaszazz has a fantastic offer for anyone wanting to join as a Consultant - check out the "Special Offers" tab above. There is also a special monthly offer on a stamp set - this months' stamp has a decidedly tropical feel! And for everyone who places a $50+ order during March and mentions they've seen this website post, I will include a surprise gift! For those looking to do a workshop on a Saturday, please book your place at the workshops happening at Ascot Park Community Church, the second Saturday of the month. You can choose between a card making or a scrapbooking project - I will be running both workshops simultaneously, but you will need to let me know your choice of project when you book in! Hello there and welcome to my Kaszazz blogsite. 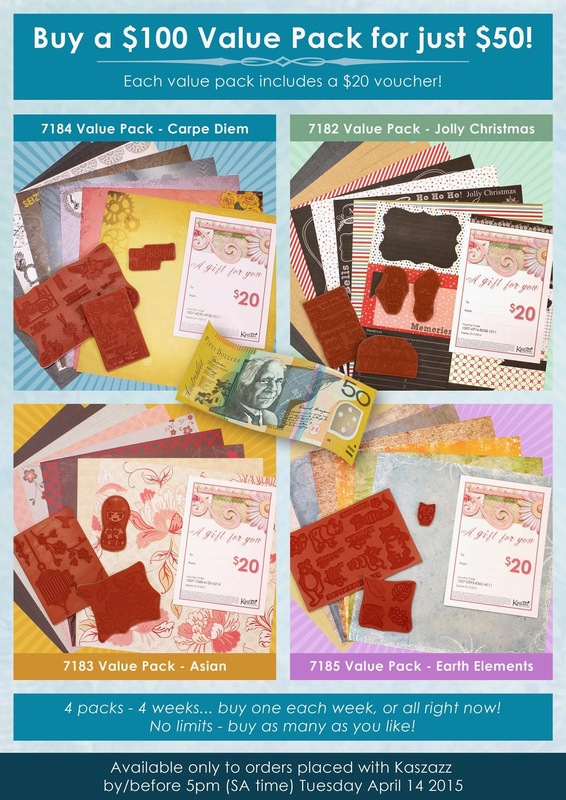 I hope to provide you with regular updates regarding card making, scrapbook and papercraft classes, as well as papercraft supplies. I am an independent Kaszazz Consultant (ID #108320) and I run my own business using Kaszazz products, workshops and demonstrations. Kaszazz is proudly 100% Australian owned and operated! Be sure to visit again soon for monthly promotions and customer specials. And before you leave, don't forget to sign up here for a monthly email update too!